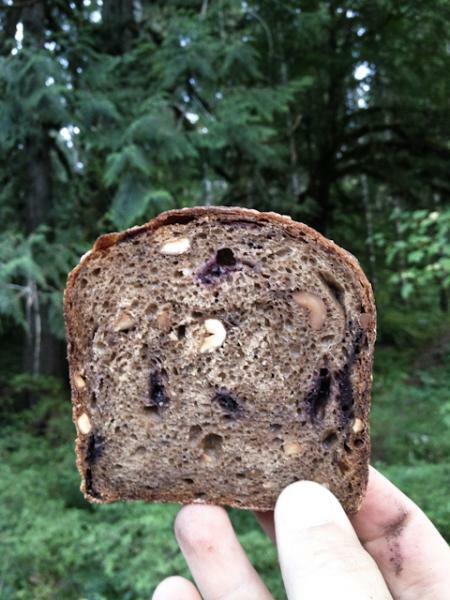 I went camping over my weekend (tuesday and wednesday) and wanted to bring along a hearty sweet loaf that would be tasty and filling when eaten alone. I think I hit the nail on the head with this one, though we ended up eating it with peanut butter and honey. Also going (relatively) deep into the big woods of the pacific north west calls for a bread that is an embodiment of that very landscape. Heres how I made it. I gave this rascal an hour long autolyse including the levain, then added the cherries, nuts and salt and mixed well with a wooden spoon, then proceeded with short sets of slap and folds interspersed with rests. I then bulk fermented for an additional two and a half of so hours, pre shaped very firmly, shaped and rolled it in oatbran and proofed for two and a half or so hours. then I baked it at 450 for 40 minutes of so, turned the oven down to 425 and continued baking for twenty minutes, then I shook the loaf out of the pan and baked it for another five or so minutes just to even up the browning. A note, though the recordable final hydration of this loaf is a pretty manageable 81% the fresh cherries impart an incrediable amount of moisture so if you give this recipe a go (which I highly suggest) proceed with caution or maybe cut back on the hydration a little. It sure is good for biking out here, whenever I get out of the city I see people biking on the craziest roads. Are you sure your middle name isn't Lucy? though I'm sure she would of dug this loaf. was buried in the ground in the back yard, Lucy would find it and dig it up - no worries! And....she wouldn't share any of it either. I'm sure if this loaf was buried in the ground in the back yard, Lucy would find it and dig it up - no worries! And....she wouldn't share any of it either. Ooooo... Lovely. May I feature it on the homepage for a bit? And "Rouge" should be Rogue Chocolate Stout, from Rogue Brewery? Would fit in my backpack, anytime! 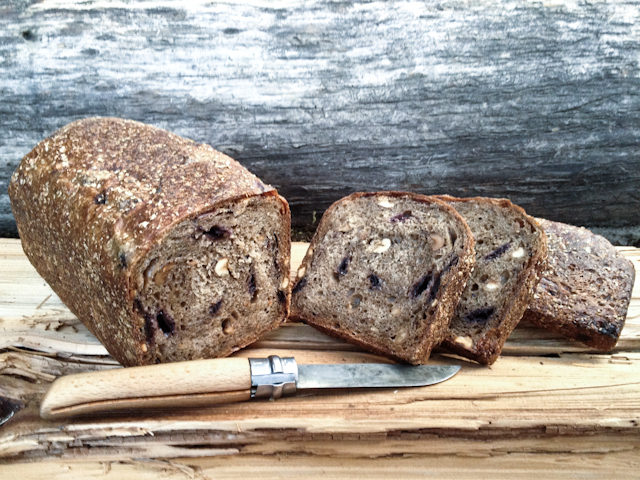 That is one handsome loaf, sturdy, grown-up, and worthy of a woodsman. I love the well-matched ingredients, and bet it tastes great! And nice touch with the knife in the pic! the ingredients really went great together, and I'm kinda proud of the knife as well, couldn't dig a hole with it but it sure is well suited to cutting up bread and cheese. to be dropped into a toaster and then have butter slathered all over it. Drool! Beautiful loaf of bread. I love this bread! How can it not taste great with all of those wonderful ingredients? this certainly was a bread that was made by what went into it, I'm looking forward to making it, or something like it again. That looks so good. Being new to baking it is alittle advanced for me yet but im saving the recipe. I think I want to EAT it NOW!! it was a tasty one for sure. What size pan did you use to bake the bread? Thanks for letting me know what pan size you used. I don't have that size Pullman but have other pans near the size you used. Definitely have to make this. I'm a newbie here, how do you make 120g Ripe Levain ?